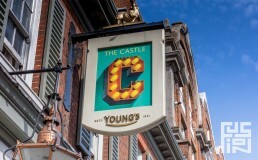 Fusion By Design were asked to return to The Castle to assist client, Young’s, to revive their successful high street pub in Tooting. 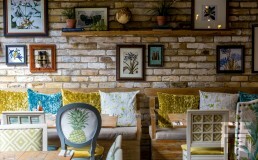 Introducing deep blues and greens with highlights of coral to create a warm, rich bar with opulent velvet and floral patterns making an elegant and inviting bar area. A feature botanical wallpaper in the dining room brightens the central area and balances the bar and the conservatory with the vibrant green. 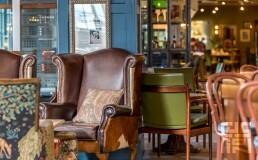 The existing furniture was revived and the timbers finished with a natural oak stain giving a warm, reclaimed feeling providing a comfortable environment for guests. The colours become lighter and fresher towards the dining area and conservatory with bold teals and greens complemented with tropical patterns to link with the garden colours.